Picked up Yuki at the Wells Fargo in San Andreas and headed to New Melones (not so much a puddle any more) lake. Since we were meeting our friend Jim who hails from Sonora (California) we stopped under the Highway 49 bridge where we expected to find him. You know where I'm talking about, we've been there a dozen times before. If you make the picture below large, notice the outcropping of land, not the one close, but the one beyond and that is where we were fishing the last time out there. 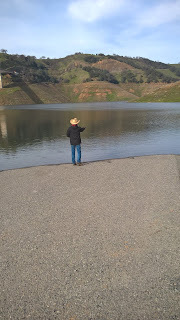 I was actually fishing in the place where we used to park. Yuki got the first two hits on orange Power Eggs, but missed both. I guess he finally used enough Superglue because the third one stuck. 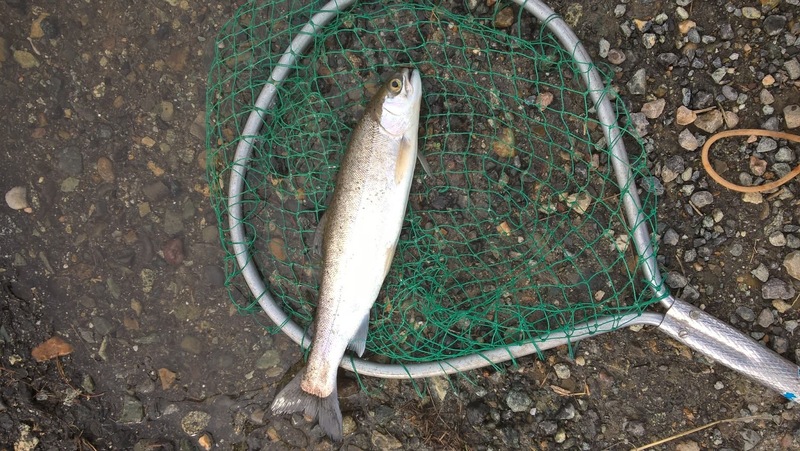 It was a nice 12/13 inch Rainbow. 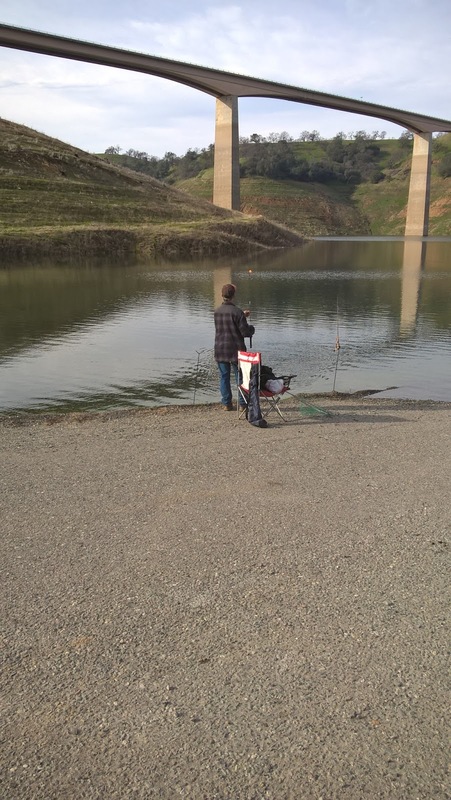 It was his first fish of 2017. 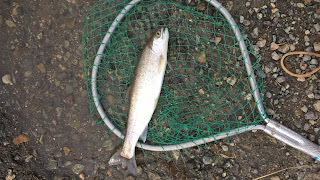 I took second blood (on orange Power Eggs) with another nice 12/13 inch Rainbow. It also turned out to be my first fish of 2017. Just then, Jim hooked one on a Kastmaster and chocked up his first of 2017 also. A definite day of first fish in 2017. School (fish school that is) was in session. Yuki put one more on his stringer so that he took home two and Jim with his and mine took home two also. 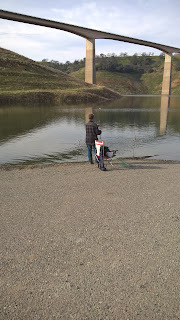 Keep in mind that they haven't planted New Melones since October 23rd. last year. 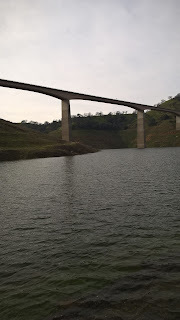 I took the picture below to show you how much water has gone into New Melones. Used to be a long way up to the 49 bridge. 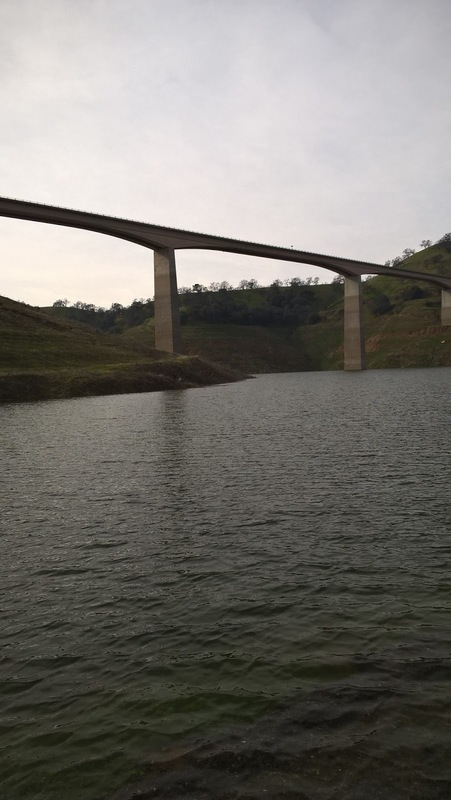 So New Melones is far from full (only 32% at last count), but it's definitely coming along. So well in fact, the launch ramp at Tuttletown where we used to fish is now in the water. Last time I was over there you couldn't even see water from the ramp. No more fishing this week. Rain from now probably through the weekend. We'll be back out next week. First fishes all around! Excellent! Good job guys, my first fish won't come until spring! I am pleased to hear that you folks got a good supply of rain and snow and that water levels are improving so significantly. Fish gotta' eat sometime, and, you fellow's did a good job obliging their need. 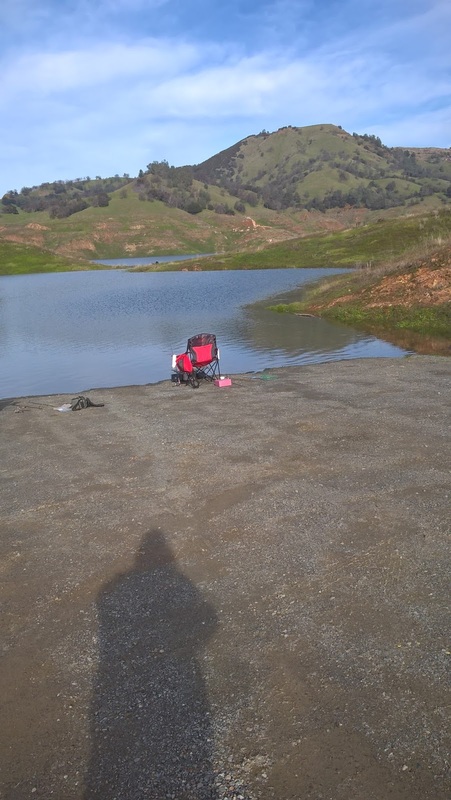 Thanks for the pictures, it helps to see the increase in water levels. Mark it's so good to see your drought breaking.